white is allowed but NO other colour!!! so orange black and white only!!!! circles MUST feature heavily- somewhere or somehow!!! 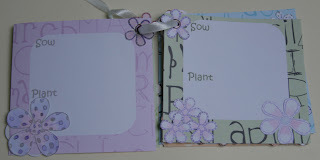 other things can be added as long as they are within the colour scheme!!! and remember if ya get stuck...funky fairy has some orange coloured papers on the free section,just sign up and away ya go!!! I have been playing with my Cuttlebug animals so used some of Funky Fairy Cool Coordinates orange paper for the lion and giraffe and behind the monkey (eyes, etc): Shame they are a bit small to see the circles pattern. 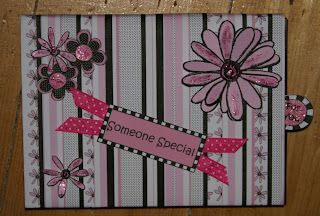 Used Doodles for Daniel to stamp white Brilliance flowers on to black and then mounted on to my own dotty paper and on to black and orange card with orange mini brads. I think the orange/black is quite sophisticated so want to do the same now with big orange flowers instead of the animals. If you want to have a go, and there is a prize, check out the challenge blog: You have til Sunday. 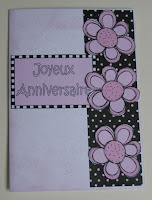 A French blog, Cartes Maniak, have challenges each Thursday so I have made this card using the sketch for challenge 37. 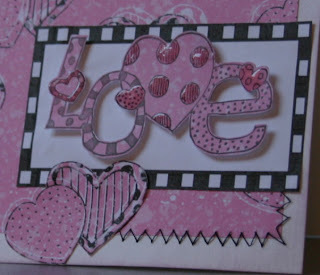 It is using Funky Fairy Pinkie Pops paper and frame topper with the Doodles for Daniel 'Love' stamp. Added a bit of 3D glaze and stitching, et voila! 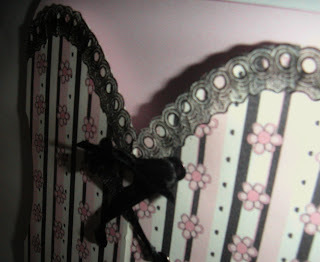 Funky Fairy Challenge 4 - Winged thingy! Well, I have lost it all this week: mojo, my stazon, marbles, the plot and where did the week go? I want them all back! Andrea set a great challenge this week: Create a papercrafted item incorporating a winged thingy, It could be a Funky Fairy, Butterfly, Angel, Cherub ( do cherubs have wings?) etc.... but it has to be the main focal point of the item. 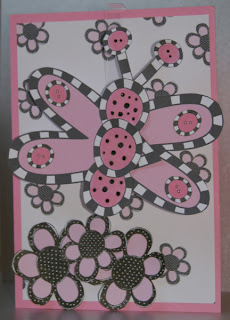 The whole card is using Pinkie Pops I used hearts for butterfly wings and cut the bottom of the lower heart to make the antennae and buttons with pink glaze for the body and decoration. The butterfly is mounted on an acetate strip folded so the butterfly hangs clear of the card and it moves beautifully but not happy with card overall. Too much pink? 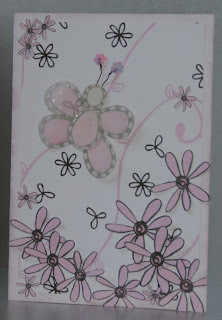 However, while playing around with the Doodles for Daniel stamps I had another idea that one of the flowers could be cut to make a butterfly so I stamped and coloured on the reverse of this Papermania glittered vellum and cut out the flowers so that the middle was attached to one petal and I turned these round and remounted them with wire and sequin antennae. 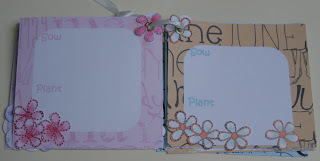 Used different Pinkie Pops for backing and embellishments and made these two cards. Will be good for girls' birthdays. If you have a Craft Robo you might already know that many gsd file templates, offered freely on the UK Scrappers site and elsewhere on the internet, were copied on to CDs and being sold on eBay! To fight against the theft a number of talented UKS designers offered previously unpublished designs and compiled their own CD which can be bought here. You'll need to be quick though as there are only a few left. There are tons of very clever pop-ups and all sorts of images. 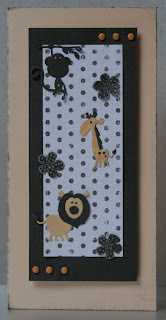 Here is one decoupage by 'Emerald' mounted on one of my backing designs and Anita's sticky ribbon. Love his wistful look. It's not just for Winter! 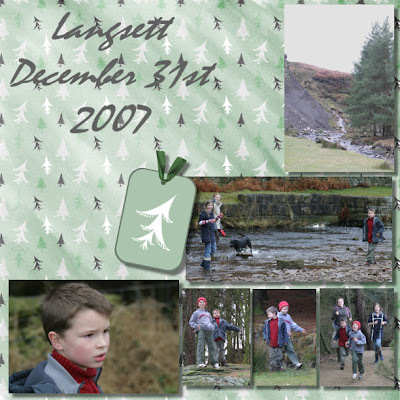 I have used the Winter Collection here to digitally scrap some old photos: I have used the 'big trees dove colourwash' with plain Dove and 'tiny trees Dove' layered on top of each other under the 2 photos and then played with 'tiny trees white - dove' and 'dove snow storm' to make some buttons (Can you spot which ones they are?) 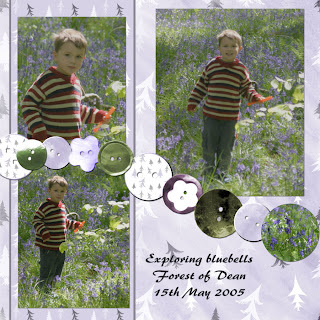 so I've just made an 'extras' page to include in the collection with the 9 buttons shown here. 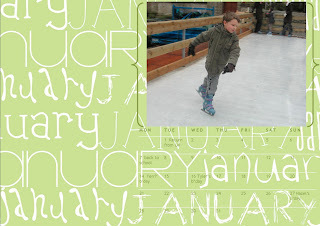 The following card was for challenge 35 on Cartes Maniak: Papers and tag from the Winter collection. 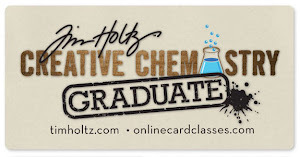 On very porous card the colours come out much paler than on coated stock. This is the lilac and silver. Sharon has given me an award! Thank you Shaz. As she has given it to the rest of the Funky Fairy design team plus other people with fabby blogs what can I say but 'Right back at ya!'. Apart from making me laugh with her ramblings, and worried when she's not (wondering what shes' up to), she literally makes my day as there aren't many where I'm not using some of her designs. I am posting these now as I have a little excitement of my own to reveal later. However at the moment I keep being drawn to Pinkie Pops whilst shouting 'but I don't DO pink': It has totally converted me! 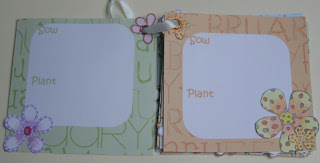 Sticking with the garden theme, when I was in the greenhouse last week I felt the need to have a small note book of what I should be sowing or planting each month to save me constantly rifling through the seed packets. I had the Funky Fairy 'Months' in mind and when the Doodles for Daniel stamps arrived on Saturday I went in to flower heaven. After lots of playing, stamping, colouring and cutting out of small flowers I ended up with this to brighten up my planting days. December is going to say 'Clean the greenhouse!' when I finally finish it. 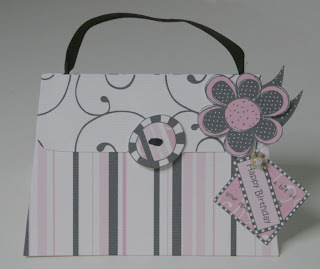 I think a chipboard birthday book or some such would look fab. My neice, Terri, is 15 today: Happy Birthday Tez! She is creating a fairy garden so as part of her pressie I made her this garden fairies set from Cuddly Buddly, complete with the seeds and note cards etc. The plant tags are on acetate, folded over the kebab skewers and glitter glued down to make them weather-proof (I hope). Made it last week but can reveal all now: Hope it arrived on time! May all your flowers grow. Well, while making my card for the Funky Fairy challenge below, I decided it wouldn't be too hard to do a bit of a rearrange of the spare card I'd printed to make a 'shadow' card for the Daring Cardmakers challenge: All the same ingredients but arranged differently for a different occasion. Apart from changing the sentiment, which is allowed, the only other difference in ingredients is that I didn't colour in the 3 brads pink, I left them silver. However I still used the same permanent pen to colour the staples as before so it's still there! Did also use 3D stickies this time but I think that's allowed. 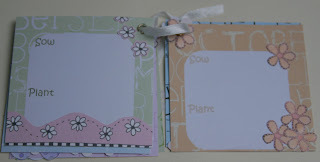 I have set the Funky Fairy challenge this week: A no-glue card challenge! Did I make it too easy? 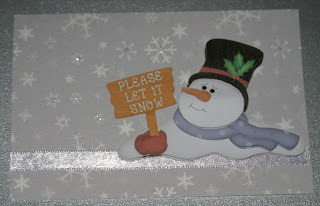 If you would like to join in, leave a link to your card on this blog or see the Funky Fairy Challenge Blog here. 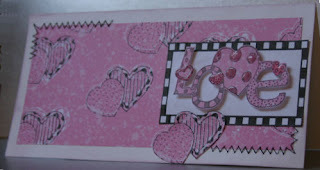 Well, just to kick off, here's one I have made using Funky Fairy 'Pinkie Pops' collection for the backing card, stamped card, heart motifs and sentiment. I cut through the hearts and card to create an aperture with the silver net behind and held them and the Doodles for Daniel 'love' stamped image together with the brads and stapled the ribbon on. 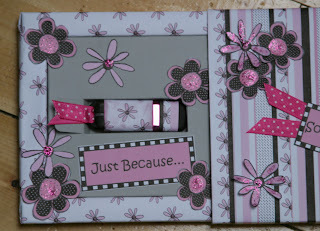 Here's a 2nd 'no-glue' card using the Funky Fairy 'Perfect Pinks' collection. I printed the silhouette on to one card and used another to create the frame and held these on to the backing card with the ribbon. The sentiment is a rub-on transfer. With a serious need to restock, I got down to using some of my scraps and images that I'd stamped and coloured but not used. Managed to get 13 cards done yesterday afternoon, here are a few: The hedgehog and sheep are Penny Black stamps painted with H2Os; everything else is using Funky Fairy: Rags 2 and backing paper and Funky Birthday, Funky Flowers and Pinkie Pops collections. I used pearly paper from The PaperMill Shop under the stamped images: It has a beautiful off-white sheen and is very strokable! 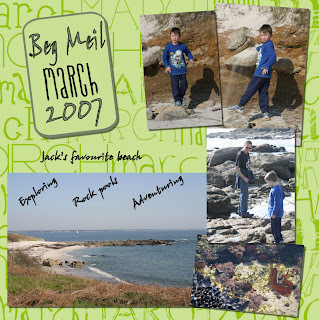 Here are a couple of quick digital things using Funky Fairy 'Months': Just for our enjoyment as a family: Our current desktop and a scrap page. 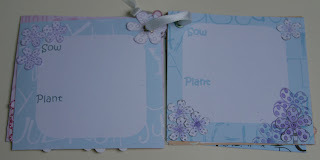 I'm waiting very impatiently for my Cuttlebug embossing folders to arrive so I can have a proper play with my new toy. Did the post lady arrive with them this morning? No, but she did come in and buy 3 cards! Hey, look and it's only Tuesday! One of my resolutions was to be quicker at getting the challenges done! 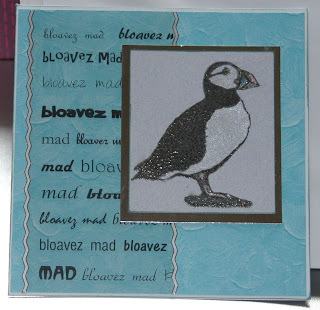 This week's Monday challenge was to create a card from a sketch which can be seen here. Tougher than it looks! 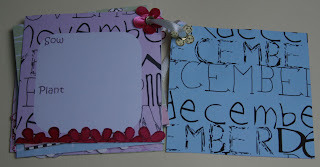 And sorry for the dreadful photo: Card looks a lot better than it appears here. 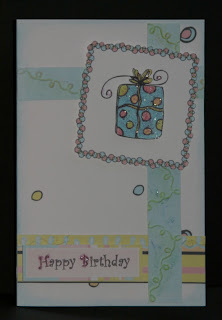 It is using Funky Fairy 'Funky Birthday' kit with one pattern printed directly to the card and the card edges chalked round, strips of another patterned paper put through my new cuttlebug and chalked and a good dose of glitter given to everything! 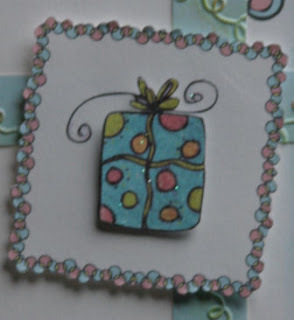 Another resolution was to join in more challenges and it helps that this fits with the new Daring Cardmakers challenge of using crafty christmas presents as Santa bought me a cuttlebug, which I love. 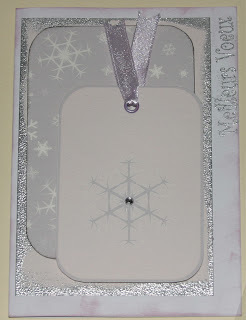 Only want it for embossing and the odd thing my craft robo won't cut but, while I am waiting for more embossing folders, I used a square repeatedly at an angle to get the streamers effect on this card. Told you wouldn't be long! 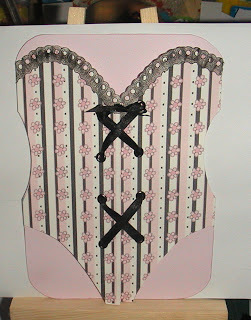 Here's a corset card I have made using Pinkie Pops. This will be for my sister-in-law's birthday later this month so shhh... don't tell! Also my Monday Challenge item is using Pinkie Pops too. Sharron's challenge was to alter an item using any Funky Fairy products. 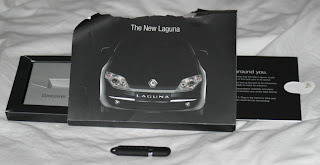 Well, this bit of junk mail from Renault was waiting for us in UK: It is a great design where the inside parts slide out on a piece of plastic ( had to disassemble it, ie rip it apart, to find out how that worked!) to reveal a USB pen that I have reformatted ready for use. 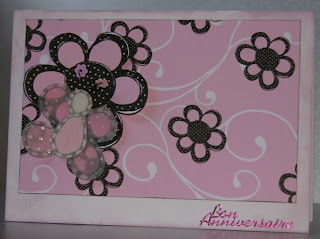 I was so impressed with the design I kept the lot and felt it was screaming to have something done with it so that's what got the funky treatment: The box and the USB: Perfect for sending some photos and scrapbooked pages to a friend/relation in UK to show them what we're up to over here in France. Funky Fairy launched 'Pinkie Pops' on 1st January so I can now share another I made earlier: Hope you like it. 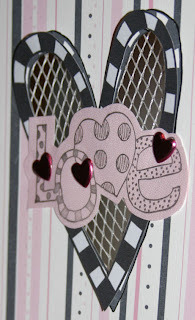 The papers and all embellishments are from the Pinkie Pops collection. I just designed the bag and added the ribbon. 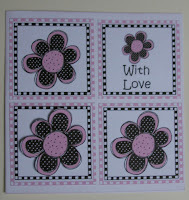 There is lots of variety in this collection and I love it so there will be more creations appearing very soon. 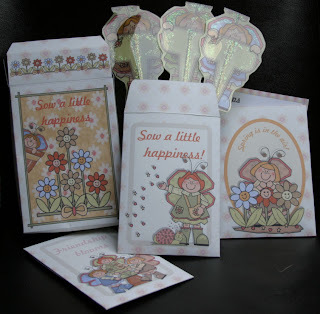 Sharon is running a Pinkie Pops competition on her blog - see links over to the right for the Funky Fairy blog and website. 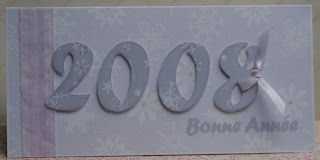 Firstly, happy new year / bonne année for 2008. Where did the time go? Hope your holidays have been good ones. Some differences we've discovered in France this year: Boxing day is NOT a bank holiday and no stockings over the fireplace; slippers are left out instead! Our first Christmas in France was lovely and we had a great 6 days in the UK over New Year visiting friends and family.